Some wicketkeepers are lieutenants, directing traffic and fine-tuning the field, in support of a captain's grander vision. For much of his career, Mark Boucher was one of these, as was latter-day Kumar Sangakkara. Others are buzzing mosquitoes around a batsman's face, occasionally venturing a stinger. Like Ian Healy or Brad Haddin, more recently. In New Zealand, thanks in part to Ian Smith, keepers are often referred to as "the drummer in the band"; the man beating out a tidy rhythm, whether the guitarist is descending into a riff sequence, or the singer is climbing into his falsetto. They are the overlooked constant. 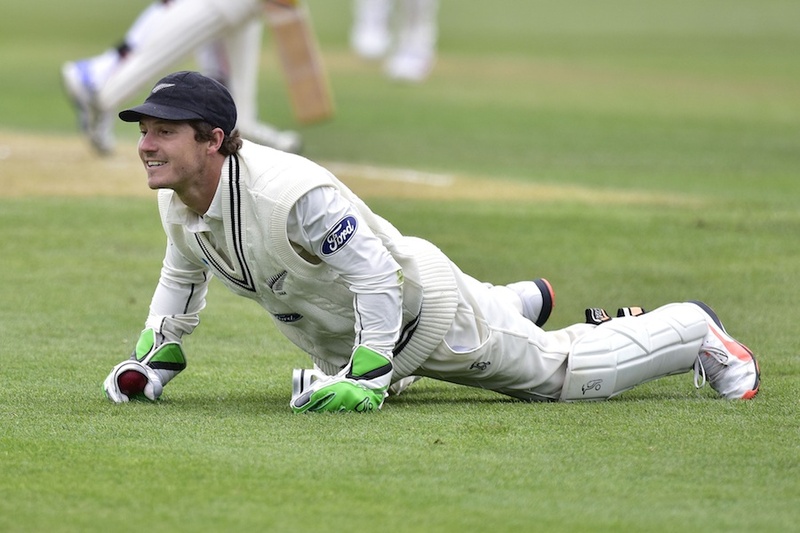 Keepers rarely control the cricket's pitch or direction, but provide depth and set the pace. Mousy, soft-spoken and often expressionless, BJ Watling doesn't really fit any of the above. He comes close to being a drummer, but even behind all the tom toms and cymbals, drummers have energy and presence. Watling is almost totally unobtrusive. He is somewhere even further behind the scenes. Backstage perhaps. Or in the office building beyond the concert hall. Watling is more like the band's accountant. New Zealand opener Tom Latham said he took particular pleasure in his century in Dunedin, for having come at home, and in the second innings. Latham had hit his two previous tons in the UAE, and had also had a huge disparity between his first and second innings average. Before his 109 not out in this match, he averaged 50.86 in the first innings and 19.71 in the second. "To be able to get the first century on home soil is certainly pleasing," Latham said. "And I haven't scored a huge amount of runs in the second innings, so it was nice to do that in that sort of situation. Any innings you score a hundred it's pretty satisfying, but to put the guys in the situation of being able to declare before lunch and have a crack at them was certainly our plan. It was nice that that came out that way." Latham said New Zealand didn't expect the last seven Sri Lanka wickets to come easily. "The pitch is reasonably flat. We are going to have to certainly work hard for our wickets and there is a little bit of uneven bounce there. If we hit the right areas tomorrow, then hopefully we can extract a little bit of that uneven bounce and take a couple of early ones." There are no extravagant oohs and pained looks when the ball whistles past a flashing blade. Some keepers throw gloved hands to heads when batsmen play and miss. Many stand still with one arm crossed for a few seconds, looking gobsmacked. Watling makes those takes, and passes them off to the slips as if they were any other. He is just filing another tax return. Watling has been so prolific behind the stumps because he is so organised. The binders are all in the correct shelves. The files are all perfectly labeled. He begins to rise in sync with the ball, and his eyes are glued to leather until they are looking directly down at the rubber of his gloves. He has such soft hands, which come in handy when he is at the crease too. Brendon McCullum's bat makes emits a crack, whichever shot he plays. Watling's, some fans say, is noiseless when he is defending. He vacuums up opposition edges, but his own often fall short of the slips. Untouched by flair is also his footwork, which experts say is almost flawless. Watling moved quickly and dived nimbly to his right to pluck a tough catch on what turned out to be the last ball of the day, yet he failed to kick up his heels. The pose - outstretched on the ground the way he landed - was not held for long. Having made a spectacular take look almost mundane, Watling rose, a sheepish half-smile on his lips, and gave his team-mates limp high fives. It was the second time he had equaled the New Zealand record of nine catches in an innings. And what's with the name? In typical accounting style, he seems an obtuse figure of light fun. He could go by Bradley, if he wanted, or even John, and barely anyone would think of the other initial. Instead he calls himself BJ. Does he know ribald jokes do roaring trade in New Zealand? Come on, guy. Just help yourself a little sometimes. Maybe the unassuming demeanour inspires trust from his team-mates. Behind the wicket is where this seam attack earns wages for their labour, and they all rate him highly. Tim Southee called him "arguably the best keeper-batsman in the world" after Watling had completed six catches in the first innings. Trent Boult has spoken glowingly about him in the past. With Watling covering so much ground, first slip can stand a little wider. Gully can be a touch squarer. "The keeper sets the fielding standard," Southee had said, "and BJ has set a hell of a standard over the past two years." On the occasions that he talks, Watling's word isn't taken lightly, and it fits that he is most outspoken in the discussions preceding DRS challenges - one of cricket's least glamorous acts. The bowlers look to him for support. McCullum usually follows Watling's hunch. "BJ will have logged the line and height," they think. "He's conscientious that way." Everyone knows it would be more fun to go out drinking with Southee, or Doug Bracewell, but before you step out the door, you'd call Watling to come babysit your children. He is a refreshing point of difference, this industrious blank slate. It's nice that as McCullum's sparkle ponies jet around the world blowing rainbows out their backsides, they are anchored by a cricketing square, whose work is indispensable, even if it is unheralded. With seven wickets still to get in the second innings, Watling has a chance to equal the world record for most dismissals in a match. He needs two more. If he gets there, maybe Watling will show a little exuberance. More likely, there will be another half-smile; more limp high-fives.